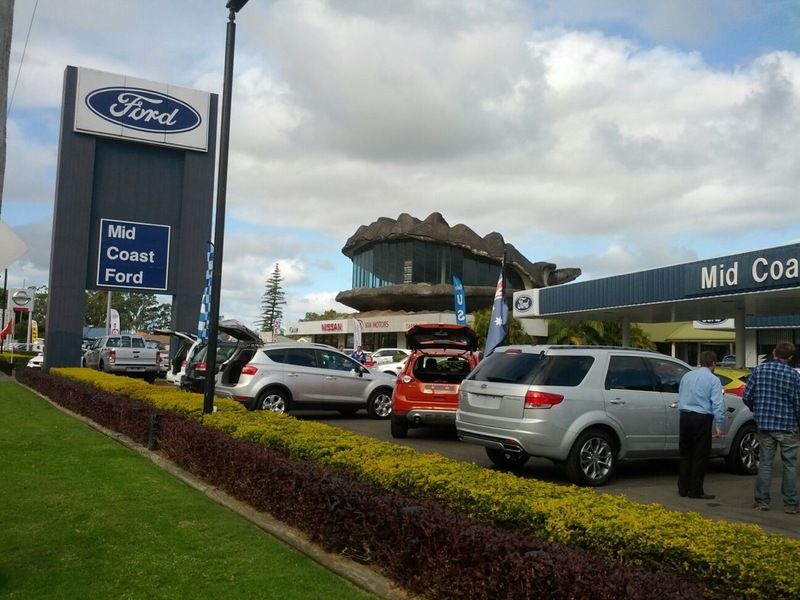 Aussies of a certain generation might fondly remember piling into the back of a Kingswood for the family holiday and cruising down the open road, headed perhaps to a beachside holiday park or aunt and uncle’s house somewhere. In between the games of “I-Spy” and kids constantly nagging “Are we there yet?”, Australia’s “big things” were a welcome sight; an opportunity to stretch the legs and entertain the kids, and maybe sneak in an ice cream. Those were the days when parents didn’t mind their kids walking down to the local milk bar by themselves, to pick up a bag of 1 cent lollies and play on the arcade machine. But in this modern age where kids are more interested in playing games on their iPods and watching movies on portable DVD players, many of the “big things”, built to entice passing motorists to stop and investigate, have fallen out of favour. Instead they sit unloved and fading, wishing for a fresh coat of paint and some TLC. I urge you to get out and see some of the 150+ “big things” that exist across this big country, before they disappear. 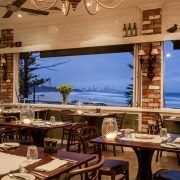 Here are a few favourites that I’ve visited on the east coast of Australia, from Bundaberg down to northern New South Wales. By far the most famous thing in Bundaberg is the rum distillery. It’s an Aussie icon, and Bundy Rum is loved by millions. Outside the distillery you’ll find the big rum bottle, hugged by many a tourist posing for photos. The bottle was originally used by the company at Expo 88 in Brisbane, before being moved to its present location. Tours of the distillery are quite interesting, and of course you get to taste the rum at the end! On your way down the coast, be sure to fuel up at this BP in Maryborough. 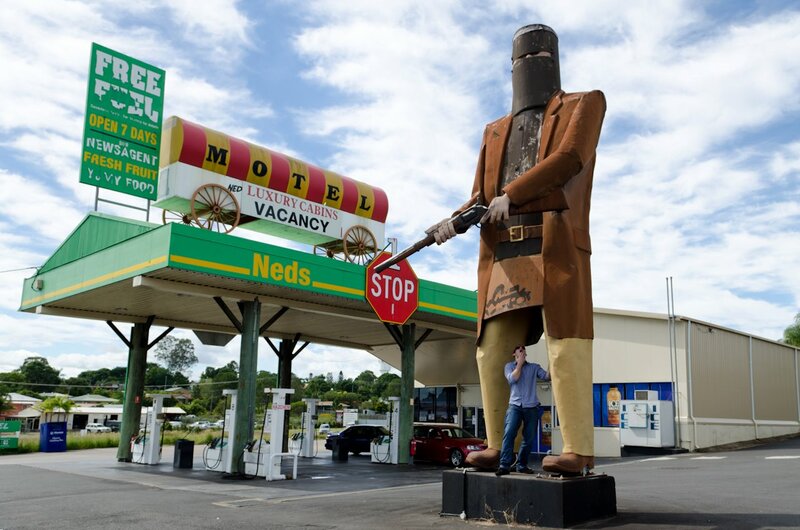 Next door you’ll find the Ned Kelly Motel, with this giant Ned Kelly out the front. I gave him a hug (as you can see below), after filling up at the BP. 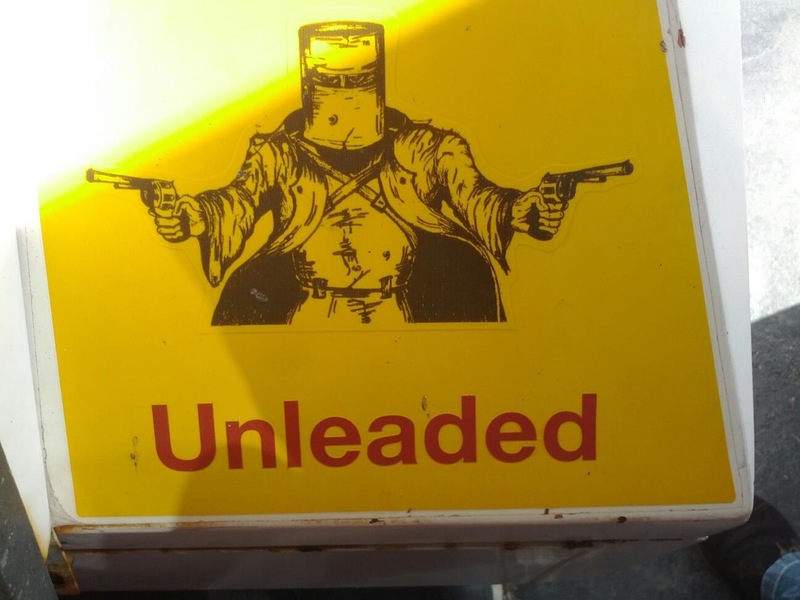 Even the petrol bowsers have Ned Kelly stickers on them. I’m not sure if that’s some sort of armed robbery challenge? That’s me, looking up Ned’s kilt! Are they encouraging you to hold up the petrol station? The Big Pineapple was a victim of the modern age. 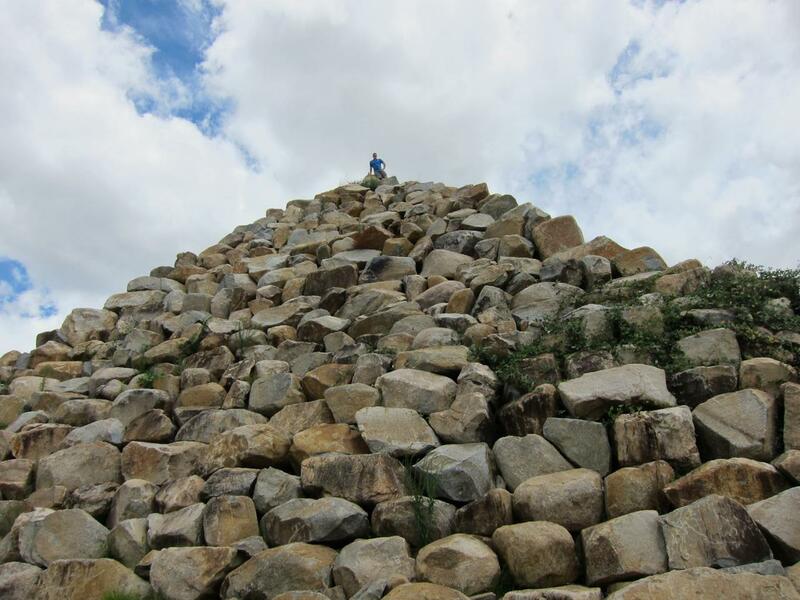 It fell into disrepair and closed to the public in 2010, before an investment group purchased the site and started restoring it to its former glory. The most important thing is that the AMAZING parfaits are back on the menu! On a weekend you can also find a variety of market stalls, a train ride and an animal farm for the kids. Once you get to Brisbane, you need to make a decision. Do you want to take the coastal route, or the inland route? Each one has its own unique scenery and things to do! 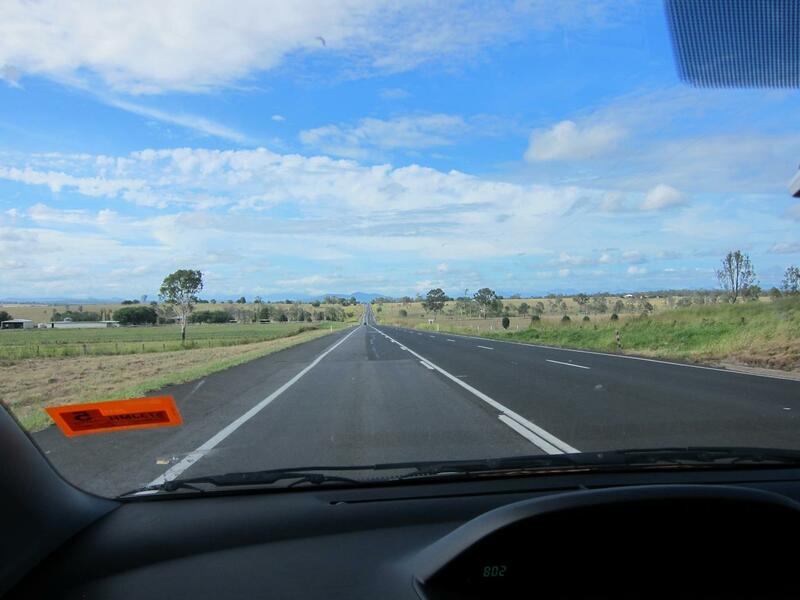 On the highway between Brisbane and the Gold Coast you’ll find Yatala Pies (take exit 38). Known as the “Pie in the Sky”, this place features a giant pie on a pole. Definitely worth a stop – the pies here are extremely popular, selling over 3500 a day. They even have a drive-thru for all you lazy people! Yatala Pies even featured on the Q150 list of Queensland icons. This one doesn’t really fit in with the rest of the list, but you can’t deny that it’s a big thing! Q1 is one of the world’s tallest residential towers, and features an observation deck with 360 degree views of the Gold Coast. You can find more information about the observation deck at the Skypoint website. 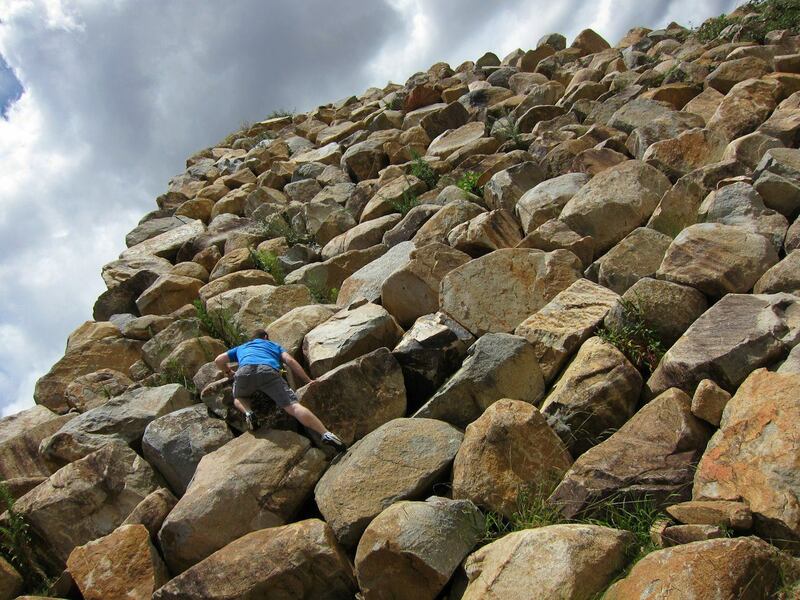 After testing whether you have a fear of heights at Q1, head to Putt Putt Mermaid Beach to see the big golf ball. If you feel like a friendly round of mini golf, they’re open until 10pm every day of the year except Christmas Day (and open until 11pm Fridays and Saturdays). 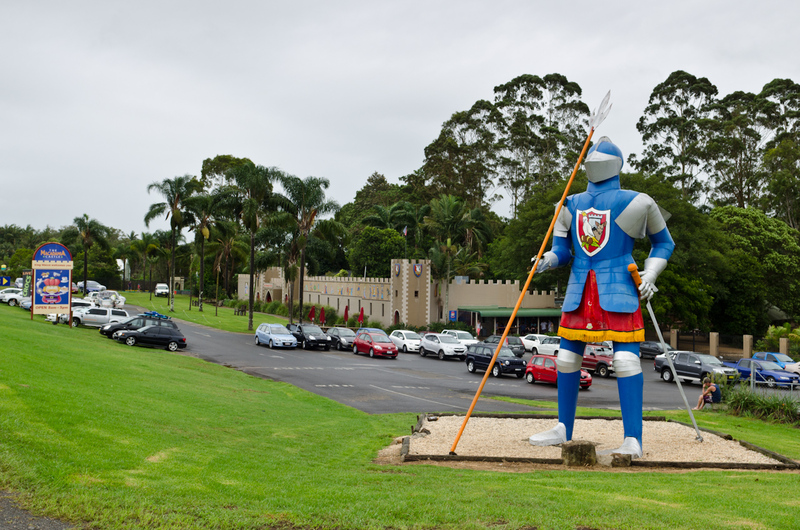 Just south of the Byron Bay exit on the Pacific Highway you’ll find the Macadamia Castle. Standing guard right out the front is the massive blue and red knight. Inside you’ll find a cafe that uses locally-grown coffee (yes, there is such a thing as Australian coffee!) as well as a gift shop selling all sorts of nuts, preserves and other goodies. There is a section out the back which requires you to pay admission, but gives access to an animal fun park, train rides, petting zoo and a giant treehouse playground. 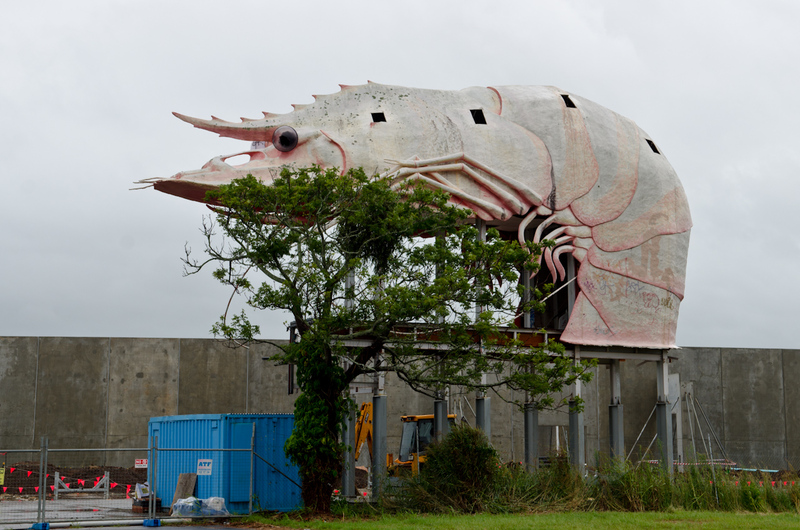 The Big Prawn in Ballina isn’t all that old, but quickly became a local icon. Unfortunately, like so many other big things, it fell into disrepair. Bunnings bought the site in 2010 and had council approval to demolish the prawn, but decided to restore it instead. The prawn was moved 100 metres up the road to the entrance of the new Bunnings site, though at the time of writing was still waiting for that long overdue restoration (see photo below). The big prawn in a state of disrepair. 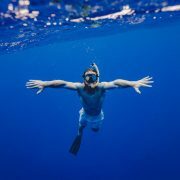 Ready for rejuvenation. 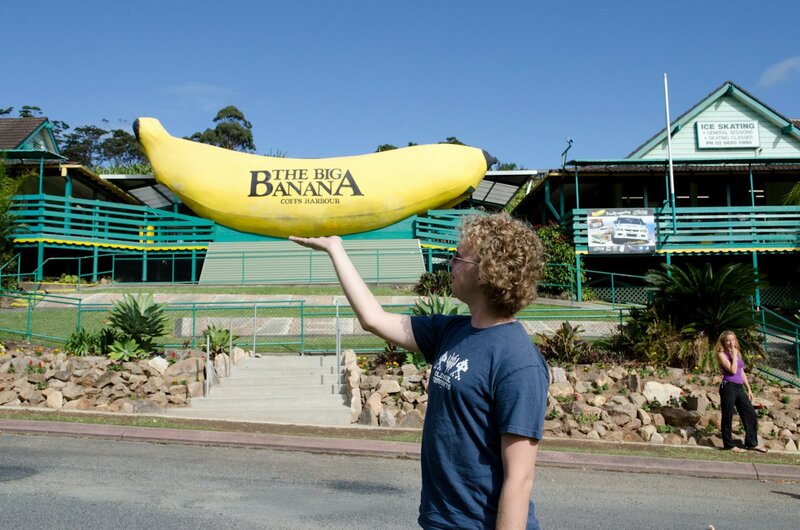 Often claimed to be the original “big thing” in Australia, the Big Banana is still a popular tourist spot on the highway at Coffs Harbour. Aside from the usual tourist stuff (gift shop and cafe) you’ll find some information about banana plantations, a waterslide, toboggan and ice skating! If you make it down as far as Taree, you’ll discover the Big Oyster. Taree’s Manning River is a big producer of oysters, and the big one was built as a tourist attraction. Unfortunately it wasn’t very popular, and is often referred to as the ‘Big Mistake’. On the site now? A car dealership, of course! 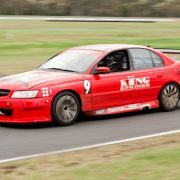 If you take the inland route down towards the New South Wales border, you’ll come across the Big Apple just before Stanthorpe. It’s situated outside Vincenzo’s deli and café (so much good food here, so bring your wallet!) and can be spotted a mile off. 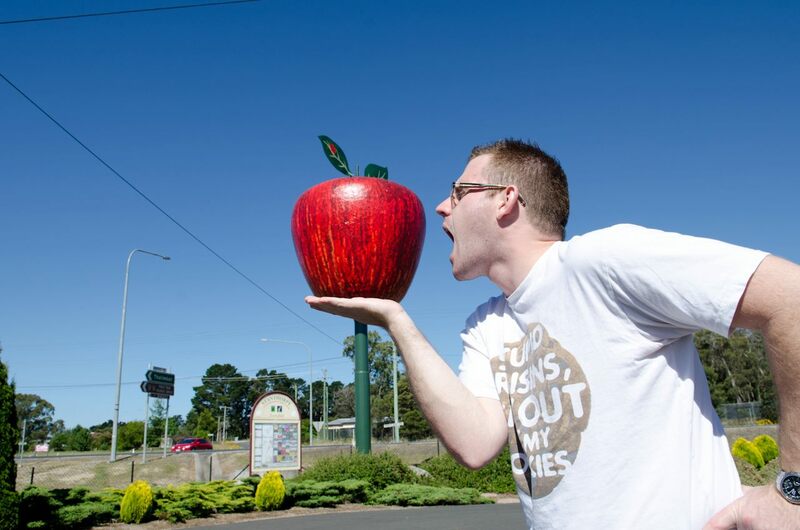 Rumour has it that when the apple was being repainted, the words “F$%^ New Zealand Apples” were painted before the last coat went on, in protest against the government’s lift on the ban on New Zealand apples (due to fire blight disease). I squinted really hard, but couldn’t see it. 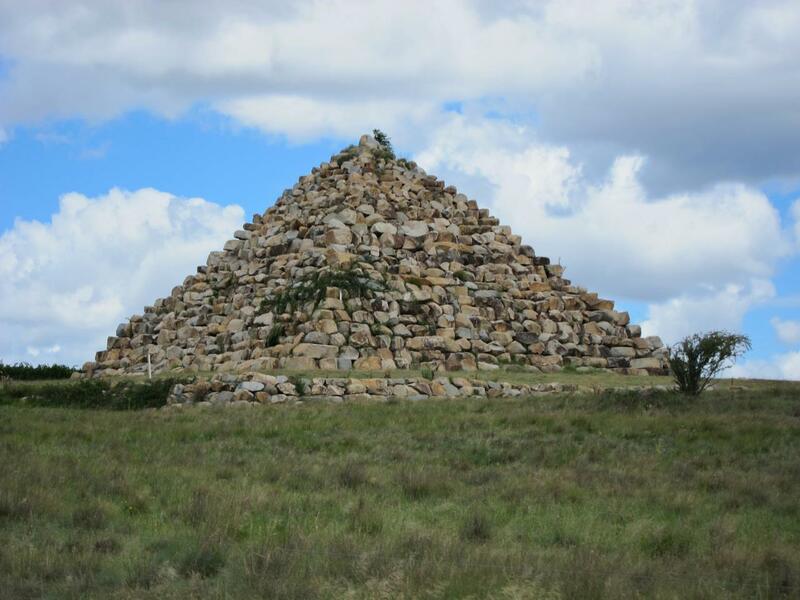 Also in Ballandean is another “big thing” that isn’t so big. This one’s a dinosaur named “Fruitisforus”. Though it’s not quite life-sized, this one’s a popular stop for motorists. The dinosaur started off as a parade float sponsored by the local fruit shop. After sitting in the elements it started to fall apart, so was taken apart and re-covered with fibreglass and concrete, and put back where it stands today, near the historic railway station. This is just a small sample of the many “big things” around Australia, but I hope it inspires you to stop and visit next time you find one along the highway. There’s often more than meets the eye with these attractions, and they usually have a story to tell.